These pancakes can make us bananas!!! 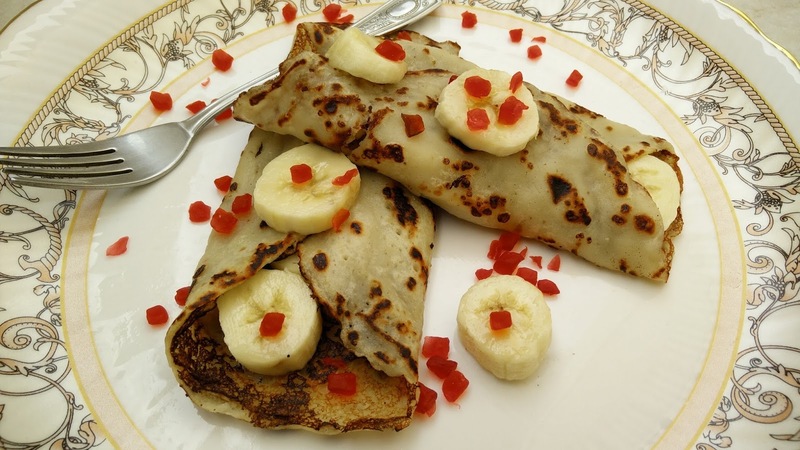 I simply mean just go bananas with these eggless banana pancakes. A very quick and simple breakfast recipe for kids and family. 1. Mash 1 pcs of banana and add all flours and sugar. Using milk, prepare a batter. The consistency should be just like that of any other batter, neither too thick nor too thin. 2. In a non-stick pan, pour the pancake batter on heated pan. Apply little oil on sides to cook the pancake. Once cooked from one side, flip over and cook again. 3. Cut another pieces of banana and stuff it inside the pancakes. Sprinkle little tutti-frutti on it or dazzle honey to enhance the flavor.